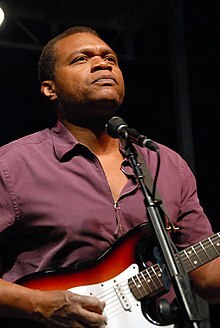 Robert Cray was born on August 1, 1953, in Columbus, Georgia, while his father was stationed at Fort Benning. Cray's musical beginnings go back to when he was a student at Denbigh High School in Newport News, Virginia. While there, he played in his first band, The One-Way Street. His family eventually settled in the Tacoma, Washington, area. There, he attended Lakes High School in Lakewood, Washington. Cray released the album Who's Been Talkin' on Tomato Records in 1980. Two albums on HighTone Records in the mid-1980s, Bad Influence and False Accusations, were moderately successful in the United States and in Europe, where he was building a reputation as a live artist. Cray was signed to Mercury Records and in 1986 released his fourth album, Strong Persuader, produced by Dennis Walker, which received a Grammy Award, while the crossover single "Smokin' Gun" gave him wider appeal and name recognition. Under the pseudonym "Night Train Clemons", he recorded with Ted Hawkins in 1986. He was invited by Keith Richards to join the backing band for Chuck Berry in the 1987 film, Chuck Berry: Hail! Hail! Rock 'N' Roll, directed by Taylor Hackford. ^ "Band". Robert Cray. 2014-04-01. Retrieved 2015-09-06. ^ a b c Eagle, Bob; LeBlanc, Eric S. (2013). Blues - A Regional Experience. Santa Barbara: Praeger Publishers. p. 106. ISBN 978-0313344237. ^ a b c d e f g h i Strong, Martin C. (2000). The Great Rock Discography (5th ed.). Edinburgh: Mojo Books. pp. 222–3. ISBN 1-84195-017-3. ^ Cray (2011). "Robert Cray official website". Retrieved 3 August 2011. ^ "Guitarist Robert Cray still has the blues". Retrieved 2017-02-07. ^ "Blues Hall of Fame inductees 2011". Blues.org. Archived from the original on 2009-08-22. Retrieved 2012-03-02. Wikimedia Commons has media related to Robert Cray.